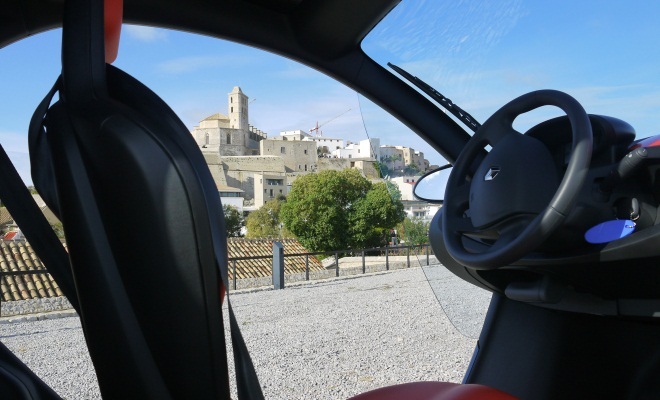 In between testing full-powered versions of Renault’s Twizy in Ibiza last week, I also got to sample the Twizy 45, a slower and lighter version of the little electric runabout. As the name hints, the Twizy 45 is limited to 45km/h (28mph) compared with the 80km/h (50mph) top speed of the full-fat Twizy 80. The slower version is also 32kg lighter – it’s not obvious where the weight has been shed – and less powerful. 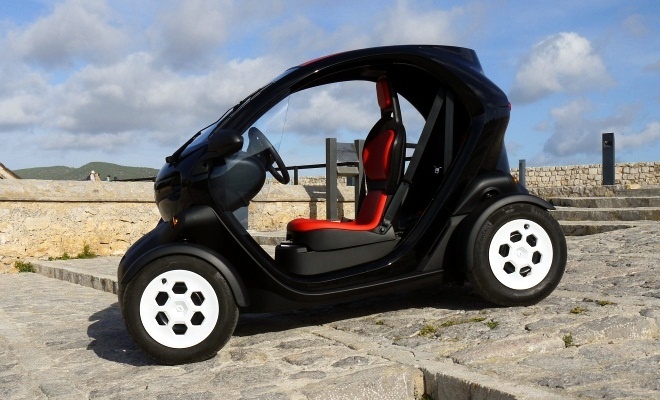 It has a 4kw (5bhp) motor, compared to the 13kw (18bhp) unit in the speedier Twizy. It should also be about £575 cheaper to buy. The curtailed figures aren’t arbitrary – they are designed to shift the Twizy between legal categories. The faster Twizy is at the upper limit of what’s allowed for a vehicle of its type – it may be a revolutionary design but as far as bureaucrats are concerned it’s just a heavy quadricycle, much like the G-Wiz before it. The Twizy 45, meanwhile, meets the upper limit for a light quadricycle. The heavy and light quadricyle categories make a difference because they alter the licensing terms governing who can drive a Twizy. In many European countries, the rules for a light quadricycle are the same as for a moped. In other words, you can legally drive a Twizy 45 aged 16 after passing a basic test. 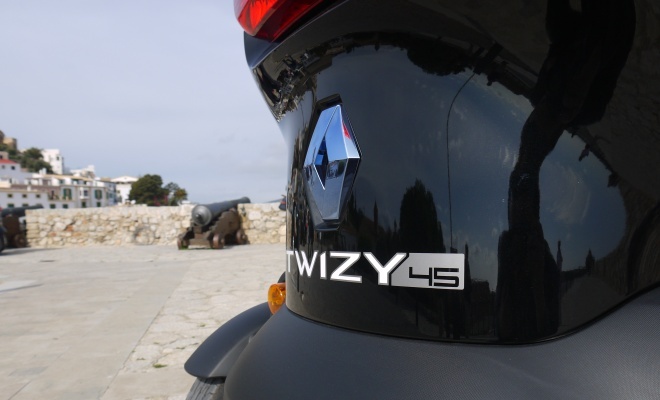 Initially it seemed as if the Twizy 45 might be irrelevant to the UK, and indeed the Twizy 45 wasn’t due to be sold here. But the UK is finally harmonising driver licensing with the EU, so from 19 January 2013, British 16-year-olds will be able to follow their French and Italian counterparts by zipping irresponsibly around in light quadricycles. Assuming they can find someone to insure them, of course. So what will they get if they (or more likely their parents) buy them a Twizy 45? From the central seat, sitting still, it’s tough to tell the 45 from the 80. Both provide the same, barely adjustable driving position, cabin and controls. 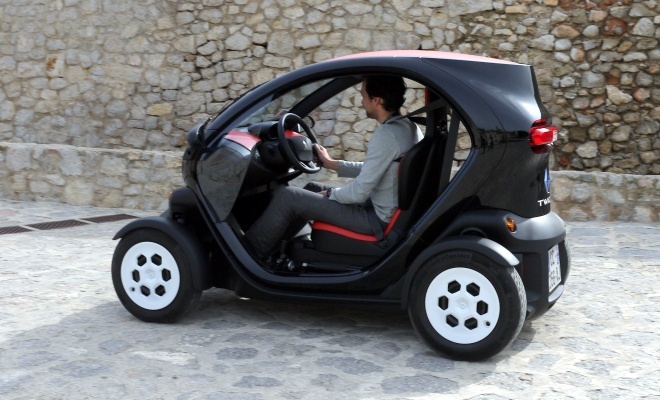 The only difference I could spot was that the Twizy 45 includes a switch on the left-hand stalk, producing a polite warbling noise designed to shoo away unwary pedestrians (the switch is there on the Twizy 80 too, but it isn’t labelled and doesn’t do anything). My test vehicle happened to lack doors as well, although they are an optional extra for the Twizy 45, just as they are for its faster sibling. Given the lack of doors it seemed wise to use both parts of the Twizy’s unusual restraint system. There’s a conventional seatbelt that you draw across from the left, plus an extra loop of inertia-reel seatbelt on the right to hold your shoulder in place. No doubt the extra loop will stop you falling out sideways, but it feels restrictive and quite uncomfortable. In Twizies with doors, I didn’t bother with the second strap – compared with my old motorbike, I felt perfectly safe even half belted in. Starting up required the same methodical double twist of key, pressing of brake pedal and release of hand brake as the faster Twizy. And with the first press of the accelerator I expected to feel as if I had left the handbrake on, but surprisingly the Twizy 45 doesn’t feel like a slug. Shorter gearing means it still manages to respond with a degree of urgency despite the lower power, although I don’t think I got above 25mph in a test limited to tight city streets. It is slower than its big brother, of course. The 45 takes 9.9 seconds to reach its 28mph maximum speed, whereas the full Twizy will get there in just 6.1 seconds. 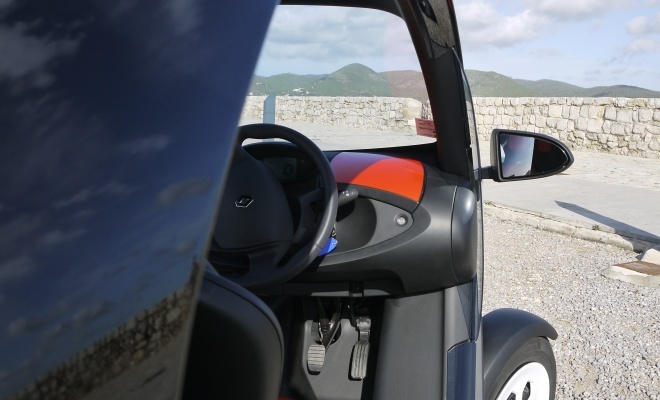 Lesser performance means a lower drain on the battery – the 6.1kWh lithium-ion pack is identical in both versions of the Twizy – meaning maximum range climbs from 100km to 120km (from 62 to 75 miles). Unfortunately the drawback of having the same battery pack is the requirement to pay the same monthly lease, between £45 and £67 depending on the terms of your contract. The Twizy 45 shares most of the virtues of the full Twizy experience, and is thus an absolute hoot to drive, but it is hard to imagine why owning one would be preferable to waiting a year to buy a faster one. But then I haven’t been 16 for many years, and am therefore of a poor judge of the Twizy 45’s merits. 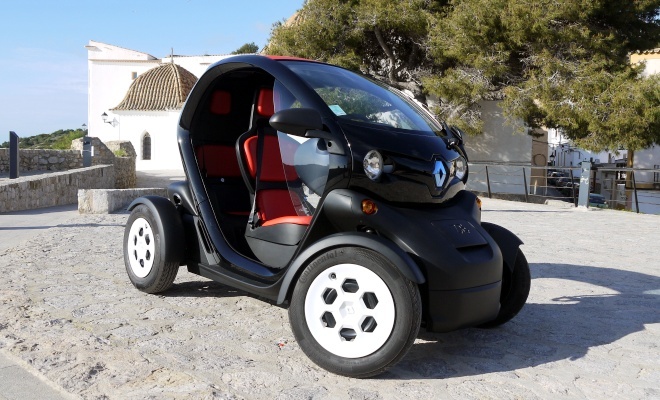 Renault UK is still umming and ahhing about whether to import the Twizy 45 – they call it “studying the sales potential” – so a sterling price hasn’t yet been fixed. But somewhere around £6,150 seems likely, if euro prices are any guide. The remaining hurdle for the average 16-year-old may be the difficulty of getting a Twizy 45 up on its hind wheels. If the local youths and their screaming scooters are any guide, when you’re spotty, 16 and stuck with something slow, a wheelie is the only way to travel.